Amazing red Honda Pilot 2003. When I first got this car, I fell in love with it! I was young when I first got it and I was so excited. It is a dull red Honda Pilot. The middle console is super nice and spacious. It can hold two drinks and has two compartments to hold storage. The seats are very comfortable and nice. This vehicle drives very smoothly and reliably. The turn radius not the best because it is a bigger car, but it gets the job done. There are two rows of three seats that are spacious and comfortable as well. The trunk gets bigger if you put the second row of seats down, which is helpful to hold more storage. The gas mileage is very nice of this car. I do not have to waste time filling this car up with gas constantly and consistently because it holds a lot. There is no sunroof to this car which is a downfall but the windows roll all the way down and are very wide. The front and back windshield wipers get the job done in a beautiful and efficient way that I am impressed with. There have not been many problems with my amazing Honda vehicle. Buying this car was an amazing idea because of how reliable and efficient this car is for me and my other family members who drive it. I have not had problems with the engine or the tires. The brakes get squeaky but they just need to be oiled. The steering wheel is nice and not too heavy. My car is an older model but it works like it is brand new. 2003 Honda pilot the perfect family SUV! Only problem I have had is the transmission blew. Cost $2, 700 to fix. Other than that it drives great! It seats 8 people great for tall people. It has adjustable seating, moveable and folding seats with detachable seat belts for when folding down the seats. Comes with 10 cup holders, 2 are in a fold down in middle row. Can fit 6 car seats comfortably. Room for storage and has roof racks. Has anti-theft installed as well as CD player and cassette player. Power adjustable driver seat and adjustable steering wheel. Power windows with window locks and auto roll for drivers window. Vtec engine goes 0-60 in under 20 seconds. Runs great in all weather conditions and comes with 4 wheel drive. The 2003 Honda pilot is a solid car for the college experience. My car is a hand me down from my grandfather and at 15 years old it is still running great! The all wheel drive is a feature I especially appreciate as I often drive back roads to get to trailheads. The trunk space is very small if you have all of the seats flipped up, but it is manageable if you are willing to make it work as I have fit 8 girls and all of our luggage on weekend road trips. This car has a cassette tape and no AUX cord, but luckily technology allows for me to still connect my phone to the stereo through the cassette tape thingy. It also plays CDs and has the radio. 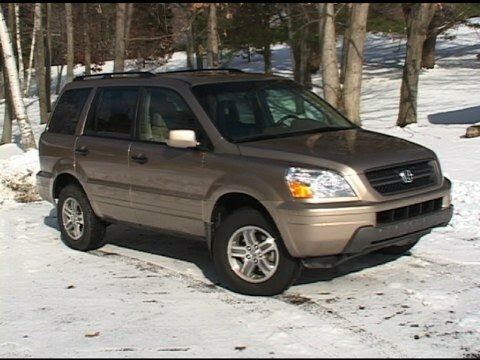 Honda is recalling certain model year 2003 and 2004 Pilot and Odyssey and 2003 through 2006 Acura MDX passenger vehicles manufactured from November 26, 2001, through August 30, 2006. The interlock lever of the ignition switch may deform, which can allow the interlock function of a vehicle with an automatic transmission to be defeated. Removal of the ignition key when the gear selector of a vehicle with an automatic transmission has not been shifted to the park position can allow the vehicle to roll away, increasing the risk of a crash. Honda will notify owners and instruct them to take their vehicle to a Honda or Acura dealer. The dealer will install an updated shift interlock lever and, if necessary, replace any necessary part of the ignition switch, free of charge. The recall began on February 22, 2013. Owners may contact Honda at 1-800-999-1009. On certain minivans, sedans, coupes, and sport utility vehicles equipped with V6 engines, a timing belt tensioner pulley on the water pump is misaligned and could cause the timing belt to contact a bolt on the cylinder head. Eventually the belt could be damaged and fail. If the timing belt breaks, the engine will stall, increasing the risk of a crash. Dealers will inspect the water pump, and if it is one of the defective pumps, the water pump and timing belt will be replaced. The manufacturer has reported that owner notification began Aug. 30, 2002. Owners who do not receive the free remedy within a reasonable time should contact Honda at 1-800-999-1099 or Acura at 1-800-382-2238. On some minivans and sport utility vehicles, certain operating conditions can result in heat build-up between the countershaft and secondary shaft second gears in the automatic transmission, eventually leading to gear tooth chipping or gear breakage. Gear failure could result in transmission lockup, increasing the risk of a crash. On vehicles with 15,000 miles or less, the dealer will update the transmission with a simple revision to the oil cooler return line to increase lubrication to the second gear. On vehicles with more than 15,000 miles, the dealer will inspect the transmission to identify gears that have already experienced discoloration due to overheating. If discoloration exists, the transmission will be replaced. If discoloration is not present, the dealer will install the change to the oil cooler return line. The manufacturer has reported that owner notification began on May 12, 2004. Owners may contact Honda at 1-800-999-1009 or Acura at 1-800-382-2238. American Honda Motor Company, Inc.â? ?s (Honda) is conducting a limited regional recall for certain model year 2003-2005 Accord, Civic, CR-V, Element, Pilot and Acura MDX, model year 2003-2004 Odyssey and model year 2005 Acura RL vehicles originally sold, or ever registered in Alabama, Florida, Georgia, Hawaii, Louisiana, Mississippi, South Carolina, Texas, Puerto Rico and the U.S. Virgin Islands, and equipped with Takata-brand air bag inflators. Upon deployment of the passenger side frontal air bag, excessive internal pressure may cause the inflator to rupture. Honda will notify owners, and dealers will replace the inflators in all affected vehicles, free of charge. The recall is expected to begin during July 2014. Owners may contact Honda customer service at 1-800-999-1009.